Does Tragus Piercing Hurt much More than other Piercings? Are you considering a tragus piercing? Are you worried that tragus piercing pain is a lot worse than the pain experienced with other body areas like nose, belly button and cartilage piercings? The tragus, of course, is a prominence on the inner part of your outer ear, just in front of the ear itself. If you’re considering a tragus piercing, you may want to learn a lot more about the pain level you’ll experience. This is simply because different people tolerate pain differently. You won’t get by with zero pain after this piercing, but it usually stays in bearable levels. When you compare the tragus to the nose or belly-button, the tragus has few nerve endings, and it doesn’t have as heavy a blood flow. This means that the chance for pain is less than other piercings. It is similar to the pain of a small cut or a sharp pinch, and it’s usually negligible. Tragus piercing usually doesn’t cause much pain, but some people experience discomfort or pressure right after it’s done. That pain may last for as long as one minute. To give you an easier way of knowing how much pain to expect, we’ll use a 1-10 chart or scale, where 1 is not at all painful and 10 is very painful. 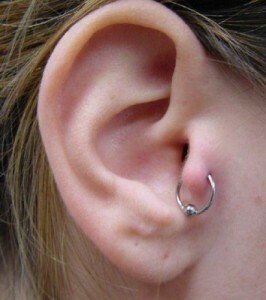 Tragus piercings usually are at a 3 to 4 level. This shows you that the pain is below average, and relatively mild. So you don’t worry ahead of time, expect to experience a smaller-sized pinch and then the sound of a “pop” as the piercing needle goes through the cartilage of the tragus. The pain is generally dull and won’t last long. If you have a thicker cartilage, though, there might be a bit more pain. Different people handle discomfort or pain in different levels. Some people may think a certain pain only hurts a bit, while others think that it hurts a lot more. Skilled and experienced piercers do their job quite precisely. This will reduce the pain you feel. Choose a professional piercer, for less pain AND for a safe, sanitary procedure and quicker healing. Your choice in jewelry will determine the pain, to a degree, in a tragus piercing. It may hurt most when your jewelry is inserted. Where the pain level of the actual piercing was a 3-4 on a 1-10 scale, inserting the jewelry has been reported by some as feeling like a 5-7 on the same 1-10 scale. Straight jewelry pieces like barbells usually cause less pain, when compared to pieces like beaded rings. New piercings will be easier if you have them done with barbells. You can always change them out later, after the piercing has healed. In addition, you’ll want to avoid any chances that you’ll have allergic reactions to piercing jewelry. Choose gold or titanium, which cause the fewest reactions. This will help your healing to be quicker and smoother. One major topic of talk is which is more painful – gun or needle? The pain levels are fairly comparable, but the needle is often chosen over the gun. Professional piercers often believe that piercing guns aren’t suitable, even for earlobe piercings. Needles are easier to sterilize, so the healing process will be smoother if your piercer uses a needle. 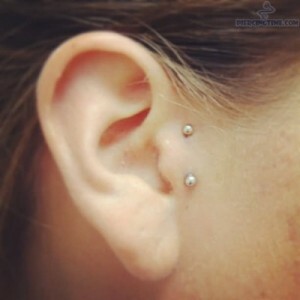 Sideburn or vertical tragus ear piercings are done from the inner to outer side of the tragus, and then back out. It’s similar to having a double tragus piercing in the ear. Before you decide to have a vertical tragus ear piercing, you should know that people who already have had one feel that it’s more painful than the tragus piercing above your lip. On that 1-10 scale where 1 is not painful and 10 is most unpleasant, these piercings range from 4-7. The increased pain is usually caused by this piercing process creating two channels on the tragus by the earlobe. 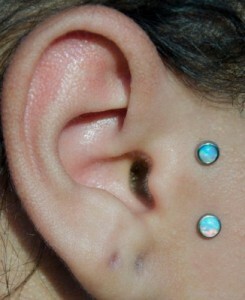 Surface ear tragus piercings are similar to vertical piercings. The difference is that the surface piercing does not go all the way through your cartilage. It just passes through the fleshy part. Surface tragus piercings are considered to be much more painful than normal tragus piercings, and even more than vertical tragus piercings. Does tragus piercing hurt more than nose, cartilage, industrial or belly button piercing? By this time, you have a pretty good idea of how painful a tragus piercing is. We’ve put the level on that 1-10 scale, which gives you a good picture of the pain you can expect if you have a tragus piercing. In order to make it even easier to estimate how much pain you may experience while the tragus piercing is being done, it’s helpful if you have already had piercings in other parts of your body. If you’ve never had your belly button pierced, for instance, comparing the tragus pain to the belly button piercing pain will not be very useful to you. As compared to piercings of the nose, cartilage and belly button, tragus piercings have been rated as hurting the least, by people who have had one or more of the other types of piercings. You may hear the popping or crunching of the cartilage in a tragus piercing, but this is normal and shouldn’t worry you. When you compare tragus piercings to conventional earlobe piercings, you would think that the tragus piercing would be more painful and difficult, since it travels through cartilage, as well as flesh. However, people who have had both areas of the body pierced report that the earlobe pain is actually slightly worse. Some people who have had tragus piercing report that they experienced jaw pain right after the piercing was done. For some people, this pain lasted for several days. It is sometimes accompanied by swelling of the area around the piercing itself. In actuality, it may be the soreness of the pierced tragus that just makes it feel as though your jaw hurts. This type of pain may be even worse when you smile. If jaw pain persists for more than several days, speak with your piercer for advice. Even though the tragus has less flow of blood than the belly button and nose area, we will mention that you should expect a bit of bleeding. It may last for several minutes. This also depends on each individual, since people have different locations of blood vessels. This means you may have more blood vessels that feed into the tragus area, compared to other people. If this is true, you may experience more blood flow after a tragus piercing than others. As far as swelling is concerned, you should expect a bit of swelling that, on average, lasts for several days. If you have swelling for longer than this, it may be a sign of an infection. Consult your physician if you have infection concerns. Does your Tragus Cartilage Hurt after it’s Done? If you’re wondering whether a tragus piercing hurts a lot after it has been done, the pain should disappear after just a few days. It is generally nothing to worry about. Mild pain and aching is expected and normal. If you are still experiencing pain after several days, you’ll want to make sure that your tragus piercing has not become infected. This is a reason for longer-lasting pain. Call your physician if you have any questions about the possibility of an infection. To determine how badly a tragus piercing will hurt, you should know that this type of piercing usually hurts less than piercing of the nose, navel or cartilage. If you have an expert do the piercing, your pain likelihood will be reduced.